A fascinating novel, full of deep conversations and interesting, emotionally hysterical characters. Dostoyevsky is a master storyteller and author--none can deny it--and he keeps you page-turning with suspense. His characters and themes are complex and rich, making you think. This novel is undoubtedly a work of genius. It is hard to choose just one theme that the book is ultimately about. Dostoyevsky discusses the nature of morality, that it cannot exist without God, and that if there is no God all things are lawful; the problem of evil; the use of justice, mercy and the restoration of criminals; the place of the Church in society, the relationship between old Russia and the new West, and many other things. Regarding the nature of morality, Dostoyevsky hits the nail squarely on the head when he observes that without God there is no such thing as right and wrong and that all things would be lawful. Atheism inevitably leads to nihilism. He aptly describes the opposition to this self-evident truth: "Rakitin says that one can love humanity without God. Well, only a snivelling idiot can maintain that." His discussion of the problem of evil is classic, but it leaves one half full, because Dostoyevsky merely raises the problem and gives no attempt at answering it. This, of course, was his purpose. His raising of the issue is extremely valuable and challenging, but expect no resolution here, not even an attempt at it. Overall, The Brothers Karamazov is extremely sentimental. Much is written to move the heart, and does so, but Dostoyevsky seems to believe that such sentimentalism is the essence of Christianity. That may be a harsh and exaggerated criticism. I don't deny but agree with Dostoyevsky that the truth of God is profoundly mysterious and sublime and moves the feelings of man in ways rational thought cannot. Christianity acknowledges and speaks to this mysterious truth and nature within us, but these things are not the essence of Christianity. It is mysterious and sublime that there is an eternal God who is the very ground of righteousness in which human beings live and move and have their being. Christianity depends on this foundation, yes, but the essence of Christianity is something else: it is the death of Christ for our sins and the righteousness God provides for us through faith in Him. The Christianity presented in the book is Eastern Orthodoxy, which is, I am convinced, unbiblical. What you will hear much of in the novel is the idea that Christ upholds man's free will, provides a basis for right and wrong, and that what is ultimately required of humankind is to recognize their responsibility to the world and to love and show kindness to everyone. By doing this one will be redeemed and perhaps redeem others. You will not find true Christianity in this novel, but only these humanistic ideas wrapped in biblical language. Though the Bible clearly teaches that sinners are justified and forgiven by the death of Christ through faith alone, we don't hear a word of this in The Brothers Karamazov, but only that we may atone for our own sins by penitence and good deeds. Jesus is set forth as our great example, rather than our atoning Savior. The existence of God, the nature morality, the importance of justice, etc., all are propaedeutical to the message of Christ. Certainly if there is no God, and no morality, and no justice, Christianity is impossible, but Christianity is a great deal more than all of these. Many people stop at resolving these preparatory questions, thinking that in them they have discovered Christ, when in fact all of these are laying the foundation for the true message of the Bible, which is that we are all unrighteous sinners who have failed to obey God's requirements, and that even so, God has shown His love for us in coming to earth to die on the cross for our sins that we might be forgiven, justified and reconciled to Him by His blood through faith alone. This gospel is the sweet sound of amazing grace that "saved a wretch like me." 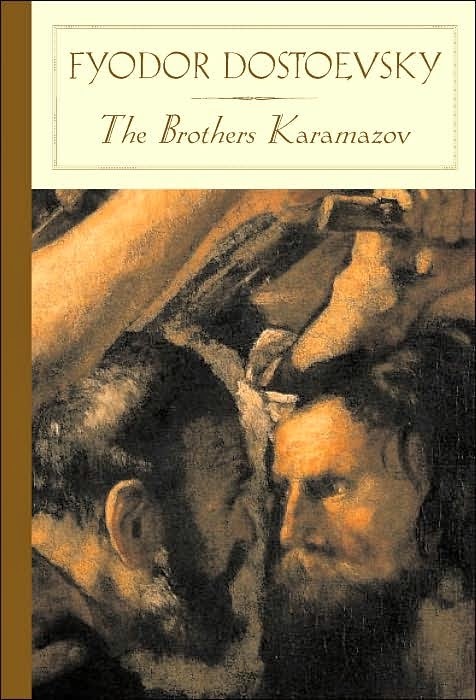 The Brothers of Karamazov is a powerful book which stimulates much deep thinking. It ought to be read. But it ought to be read with an understanding of what true Christianity is. Jesus Christ will be found in the pages of Bible, in the preaching of the prophets and apostles. What will be found here in this novel is a brilliant picture of mankind, an illustration of the various paths mankind may choose to walk, and a very entertaining story. I bought the dvd after reading about it in a book about open theism ans free will.....but after reading your review I do not want to watch the movie now.....thanks....I think? I don't think it would be a bad idea to watch the movie, just watch it thoughtfully. Every opportunity we have to learn is a good opportunity, even when we don't agree with those we are learning from.